It's not all sunshine in The California Kid's world. 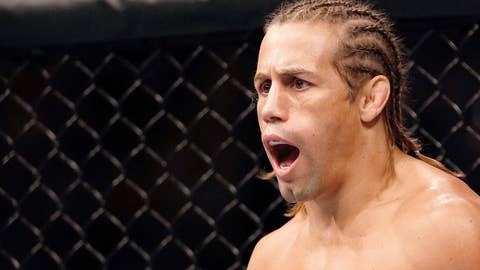 Urijah Faber is a little tired of the perception that he is gifted title shots because he happens to be one of the most popular fighters below 155 pounds. There is no argument that Faber is one of the most charismatic and well-liked fighters on the UFC roster, not to mention the traveling crowd of fans he packs in every time he competes. When he’s near his hometown of Sacramento, you can expect a circus of Faber fans filling the seats and losing their collective minds whenever his signature walk out song ‘California Love’ from Tupac and Dr. Dre hits the speakers. Popularity is great, but Faber backs up his appeal with fans by performing inside the Octagon as well. Faber first became a champion in 2004 during his sixth professional fight, and he’s been near the top of every division he’s fought in ever since. When you add in the fact that Faber has also never – in his 36 fight career – lost in a non-title fight it starts to make sense why he keeps earning all these title shots. Still, Faber can’t help but find it discouraging that the only statistics that are routinely tossed in his face is the fact that he’s 0-5 in his last five title fights. Faber believes there’s a much bigger story to his career – even in those five losses he’s suffered in the last five years. "I’ve been here. I’ve been grinding and it’s hard sometimes. You deal with media and everyone has their opinions and that’s what they get paid to do but no one knows you as a person like you know yourself. So when you hear people give you any type of grade except for what you’re expecting from yourself, it’s a little disheartening like, ‘What the hell is this person talking about?’" Faber said when speaking with FOX Sports. I’m glad to silence some of the naysayers and get some of the respect that I believe I deserve. "People forget the fights that I’ve been in whether it’s a win or loss, but there’s differences between a loss and some of the losses that I’ve had." Faber’s most recent defeats when competing for the UFC bantamweight title have come in a close decision to rival Dominick Cruz and then to interim champion Renan Barao in a fight where he suffered a broken rib in the first round. It’s not about making excuses, according to Faber — it’s putting in context how his losses have happened because it’s not an open and shut case. "My losses before that were at 145 pounds. The reason I was fighting at 145 pounds wasn’t because I was a 145-pounder. When I first started in this sport in 2003 there were no 135-pounders, 145-pounders or 155-pounders in the UFC. I was taking fights, I was weighing about 148 and I was taking fights at 155 and 145 and then I became a champion at 145," Faber explained. "My other losses are to Jose Aldo, who is the pound for pound best in the world right now in my opinion at 145 pounds, and then two to Mike Brown that one was a back elbow where I jumped into (the knockout) and another where I broke my hand in the first round and I couldn’t use my hand. Then I dislocated my thumb in the third round of a five-round fight." Add in the loss to Cruz and the loss to Barao and there are the five losses Faber has suffered since 2008. When you add in the fact that Faber never loses outside of those championship bouts, it’s hard to argue that he keeps getting the big opportunities granted to him. "There are some real general statements that are made out of pure statistics until you take a deeper look at things. I’m glad to silence some of the naysayers and get some of the respect that I believe I deserve," Faber said. "Guys like Sean Shelby and Joe Silva, the guys that know the sport better than anyone else, a lot of times I was getting flack, ‘Oh Urijah’s title shots, he gets so many title shots’. These guys know that it’s not fair if you put me up against guys that aren’t on that title level because I’m a title level fighter. So now this will hopefully be a realization to some of the media out there that’s always looking to hype the guy who is marketable for getting title shots when in reality he’s just at that level." Faber welcomes any top bantamweight fighter to knock him out of contention. In 2013, four tried and four failed, so now Faber once again stands alone atop the mountain waiting for the call to get another crack at the belt. It’s not entitlement or an impudent attitude that lead Faber to the belief that he’s the No. 1 contender in the bantamweight division – it’s accomplishment. Faber is a winner plain and simple, but if he doesn’t get the next shot at the belt so be it. If he’s asked to face another fighter in a non-title, contender’s bout, that’s exactly what he’ll do. I’m going to get that belt and be champion. And the same rules apply as before – if you don’t like Urijah Faber getting title shots, beat him, otherwise shut your mouth. While the rest of the division is belly aching, Faber will be watching cage side at UFC 169 while hopefully eying his next opponent. Then the plan becomes bringing the title back to Sacramento in 2014. "I don’t mind chilling for a bit, I’m a patient guy but if the UFC is dying for me to fight someone else, I’m not going to tell them no. I’m not going to wait on that account. I’ve never said no to any fight. You can ask Dana (White), you can ask Lorenzo (Fertitta), you can ask the matchmakers, I’ve never, ever said no or even blinked an eye to an opponent. I’ve always said yes, I’ll fight whoever, and that’s the case for me now," Faber said. "I’m going to do everything on my side to make it happen and everything in my power to make it happen. I’m going to get that belt and be champion."